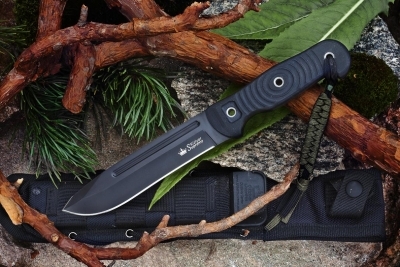 The Maximus is one of the best Utilitarian / Tactical design knives from the Kizlyar Supreme range. In incorporates the best features of a good and solid outdoor use knife with most important aspects of a good tactical knife. The 4 mm thick blade is built tough and and take on some seriously heavy field work. The blade shape itself is essentially a drop-point, but with a additional steep angle grind right at the tip, giving it that spear-point tip, which is necessary for better thrust efficiency. The G10 Super grip handle is ergonomically designed for comfort and durability. Finally, the sheath is one of the most important facets of a good military knife. The Maximus comes housed in a high quality, low profile, MOLLE compatible sheath, which keeps the knife securely in place even if the snap clip comes undone on the handle.